This story was filed by CBS News correspondent Sheila MacVicar in London. 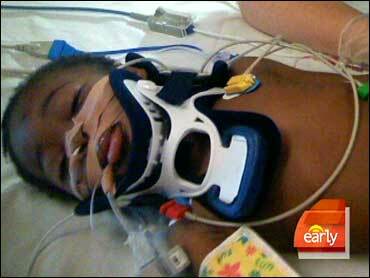 Three-year-old Oluchi Nwaubani very nearly didn't make it. Last September, the little girl fell into a freezing swimming pool in London. Tests showed she was deprived of oxygen for 18 minutes - three times longer than the brain can normally survive. "They didn't hold out much hope for her," Toya, the girl's mother, tells CBS News. Oluchi couldn't breathe on her own. Brain scans showed little activity. "Doctor said to me, basically they've not seen a child been in the water this long and pull through," recalls her father, Junior. Even if she did survive, doctors warned the prognosis was not good. "If she does, she will be in a vegetative state," they warned her father. "Nevertheless, you need to know that we are Christians and we believe in a God who can do the impossible." And, it would seem, that's just about what they got. "It was really almost a miracle that this child has a normal recovery," Dr. Vinay Nadkarni, of the Children's Hospital of Philadelphia, tells CBS News. But there is an explanation. Some young children, particularly babies, have a special reflex that they had when they were in utero called the diving reflex. It essentially slows the body's metabolism down to almost nothing, so they almost need no oxygen for the brain cells to survive," explains Nadkarni. It's like hibernation, and in cold water, brain cells are protected even more. It's a combination of genetics, reflex, and great care that have made Oluchis' story such a happy one. "We expect her to make a full recovery, because each day there has been one improvement or the other," says her father. "She shouldn't be here, but she is," says Toya. "There's still room for recovery. She's still on a road to recovery. I've said it's not a miracle instantly, it's a miracle over time."